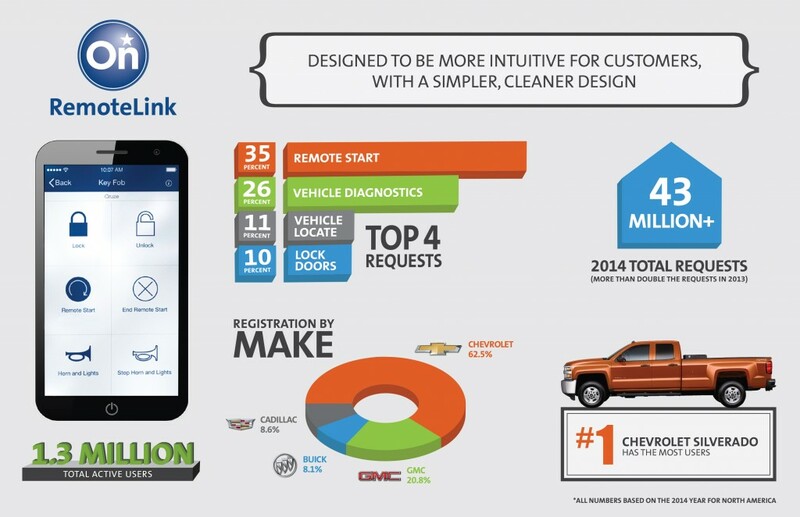 We’re pretty stoked to see General Motors release OnStar RemoteLink 2.0 app earlier this week. Based on customer feedback collected over the years, the all-new RemoteLink 2.0 features a completely-redesigned user interface as well as other enhancements that make it more intuitive for users. In its various versions, RemoteLink currently has 1.3 million total active users, and here are some more stats that you might not have seen. All numbers presented below are based on the 2014 calendar year for North America. In 2014, RemoteLink processed over 43 million requests, more than double the requests in 2013. The most popular vehicle: the Chevy Silverado, which isn’t unexpected given that the Silverado is the best-selling GM vehicle in North America. The release of RemoteLink 2.0 comes at a great time since more customers are using the app than ever before. In December 2014, for instance, RemoteLink experienced record-setting use with nearly 7 million total requests. GM tells us that usage growth has continued since, with multiple days in January totaling more than 450,000 requests in a 24-hour period. Do you use RemoteLink? Which features do you use the most? Talk to us in the comments. I use the app almost daily, and I do use remote start the majority of the time. I love starting the car while i’m still in the office and coming out to a warm vehicle. The new app is much much better, a lot quicker than the old one for almost everything. It’s never going to be instant like in the OnStar commercials, but at least now it doesn’t take 4 minutes to update vehicle info and 2 minutes to have the car execute a remote command. Any idea if it’s available on the BlackBerry Q10 yet?? Use it for lock/unlock and remote start. do not like the new white UI but it does seem to be faster. They need to make this process a lot faster. I would love to use it to lock and unlock my doors but I do not want to be standing there for five minutes, if it took only a few seconds I would be fine with using it all the time but until it gets faster I will only use the app to remote start it.